This premium network-controlled power switch provides remote/central management of AC power distribution through LAN, WAN/Internet or telephone. It is designed for power tasks such as distant power reboot, equipment power on/off control, web/network administration, power event scheduling, power event alerts. Administrators can control network devices or power equipments from any locations within local network or internet and saves trips of technical personnel. Eliminate service calls, system blackout down time and increase reliability. Each AC power outlet can be independently powered on, off or power cycle for an immediate reboot, time-delayed reboot and power event scheduling. Users can have complete control of when and how powered equipments are restored restored with a time delay or scheduled for On/Off shutdowns to conserve energy in the data center. Designed for high voltage resistance and protection for leakage of electrical currency with 15 Amp total max current output. One major advantage of this remote power is its telephone control function. When networks lock up or no internet connection, users can still control the power switch using the phone keypad to command the connected power devices. Administrators can always gain access to their powered devices by calling into this remote power switch from anywhere in the world. Other than the Ethernet and PSTN phone line connection, this power controller also offer RS232 console port for using the HyperTerminal protocols to control control power on/off/reboot. Web control through intuitive web browser Interface. 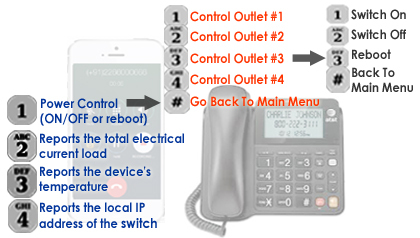 Telephone control through phone keypads with control access. Master power on/off button allows manual override from the local site. Console Control - the built-in RS232 console port can be connected to a local terminal for controlling the switch when network connection not available. This intelligent power controller is also a telephone-controlled remote AC power switch. Anyone from anywhere in the world can call into this power controller for operation and work through using telephone key pad. When the network service is down or not available, this smart power controller can still turn power on/off or reboot the connected powered equipments by calling into the power switch for full operation. Administrator can assign security pass codes to any authorized personnel to have phone control over the the power switch. Controls the 4 power outlets' operation (ON/OFF or reboot) by pressing "1" from the phone keypad. Reports the total electrical current load by pressing "2" from keypad. Reports the temperature by press "3" from the keypad. 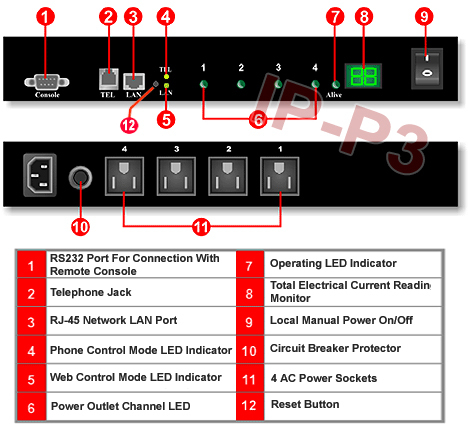 Reports the current IP address of the remote power switch by press "4" from the phone keypad. Each command entry by phone will be confirmed with machine voice to echo back the user's selection and the current outlet power status after entry made. As data servers added to the setup, power requirements and heat output are also on the rise. This remote power management unit allows remote monitoring of total amperage draw on power devices connected and the surrounding temperature. Both the temperature sensor and AC (RMS) electrical current meter are built into this power manager unit so no external sensor probes required. Its intelligent load current meter and temperature monitoring function helps administrators greatly to keep track of total electric current reading from power outlets and device temperature in order to prevent system overload in advance with better power management. 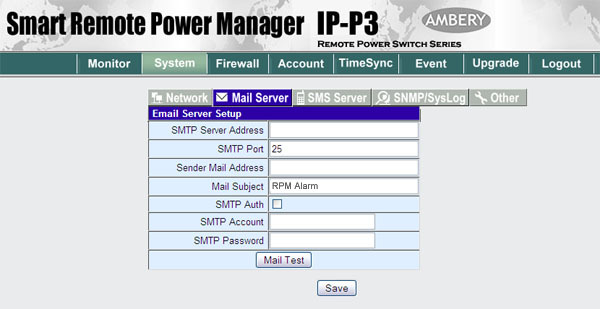 This power solution is SNMP-based so that alerts can be sent automatically by email or SMS text, if SMS server is deployed, to manager when amperage or temperature levels exceed established thresholds. System Shutdown By Current Overload: this remote power switch will be automatically shut down by its internal circuit breaker for responding to a current overload or short circuit condition. System Shutdown By Temperature: ths remote power switch has a temperature sensor built in for detecting the surrounding environment temperature.When the temperature reaches the preset value and lasts for preset time interval, the power switch will be shut down automatically. Also this power switch can be automatically turned back on again after it cools down to preset temperature point. System Shutdown By Manual Push Button: A master power on/off button on the switch box itself for local operator to override the remote control mode and take control of this power switch in an emergency. The event log can be viewed directly or archived by downloading from the web page in .csv file format and saved into the hard drive. This remote power switch also provide API function for engineers to develop customized power management applications and build integration with other programs for monitoring power status and performing desired power operations. This 2-port remote power switch is 1U rack mount ready. The rack mounting ears are sold separately. User can easily mount this equipment on a standard 19" rack by purchasing the optional rack mounting ears from us. 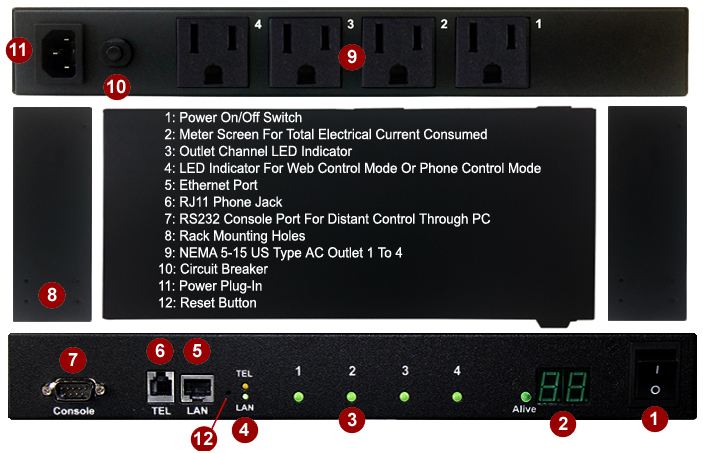 Professional IP-addressable power distribution unit with built-in web server with 4 AC outlets. 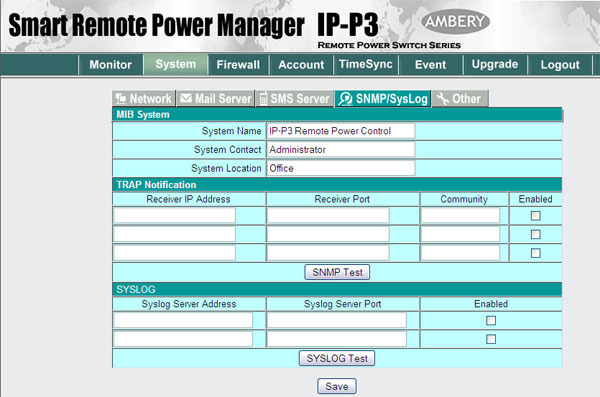 Remote management of AC power distribution through LAN, WAN/Internet, RS232 console port or telephone. AC outlets from the power switch can be turned on/off, power cycled for a immediate reboot or reboot with timed delay, power cycle sequence with assigned priority and power event scheduling. Complete power control via web, network, telephone, PC RS232 terminal or On/Off button on front panel. Real-time monitoring of amperage draw and site temperature through the internal sensor and current meter. Power-up sequence with priority so connected equipments can be started up in proper sequence and prevent sudden overloading. Supports Wake- On-LAN protocol for remotely starting up computers. Software safe shutdown help terminate running applications before powering off the computers or data servers. 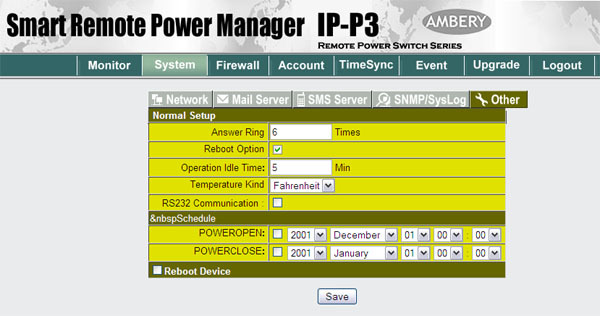 Auto-Ping function for detecting any failed network equipment and performing timely reboot or other power controls. IP filter/mask function with access management helps prevent unauthorized users' access. 15-AMP circuit breaker protection to avoid power overload and protect connected devices. 1U rack mount ready. The 19" rack mounting ears are optional and purchased separately. Power Sequencing: Control the sequence by which your power outlets and attached devices activate, helping prevent circuit overload, and ensuring that attached devices power-up in an appropriate sequence. Protection- Protect sensitive devices by keeping them powered off when not in use. This prevents hackers from seeing them at all times. Saving Energy- Power down equipment when not needed for power savings and to save on wear and tear. 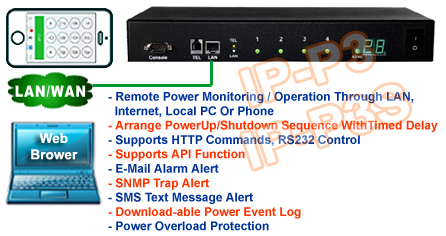 Security Notification- Power up alert devices like sirens, lamps, speakers. 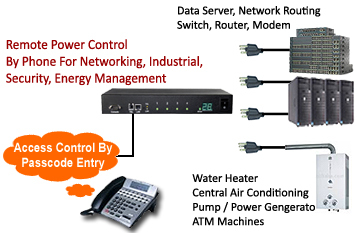 Intelligent Power Management- Power up environmental system like heaters, coolers, pumps, etc. with programmed schedules. Supports TCP/IP, UDP, SNMP, DDNS, SNTP, HTTP, HTTPS protocols. Web server design with control through LAN/WAN network. Supports fixed and dynamic IP address. 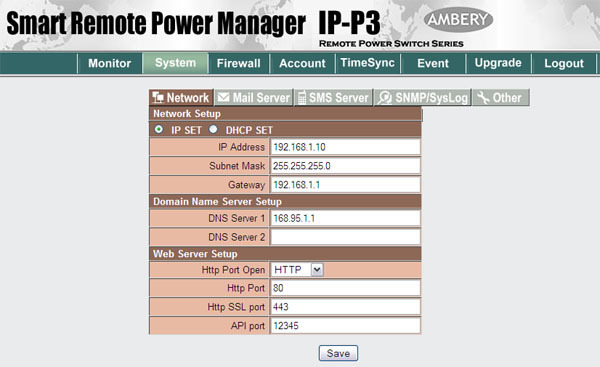 Supports NTP (Network Time Protocol ) - synchronize the time of the power controller to the Internet web time . Security password identification to ensure system stability. AC power cord x 1. Need the 1U rack mounting ears for this model ? Please click here to order it !